Join Us!!! We are looking for someone to help us cover Canadian basketball. Please send us an e-mail. Canada: Luoyang adds Rayson to their roster, ex Sudbury F.
Brady Heslip (188-SG-90, college: Baylor) had a team-high 14 points and Kyle Wiltjer (208-F-92, college: Gonzaga) added 12 points and 14 rebounds as Canada downed Chile 85-46 on Thursday in a FIBA World Cup qualifier. Melvin Ejim (201-F-91, college: Iowa St.) chipped in 12 points for a Canadian squad that had all 12 players see at least eight minutes of court time in a matchup at Mile One Centre. Canada held a 13-point lead at the break before starting to pull away in the third quarter, doubling its advantage to 26 heading into the fourth. "In the first half we just weren't as intense as we needed to be. We didn't play with enough energy so coach (Roy Rana ) just reminded the guys that you only get so many opportunities to play in front of Canadian fans," said Heslip. "We just came out with a big second half and took care of business." Canada, which improved to 9-2 in World Cup qualifying, has already locked up its World Cup berth and has one more game on Sunday when it hosts Venezuela. The Canadians clinched their spot in early December with a 94-67 rout in Brazil. Canada's last World Cup appearance was in 2010 in Turkey, coming away with an 0-5 record and first-round exit. The Canadian men haven't made an Olympic appearance since 2000 in Sydney. The World Cup, a main qualifier for the 2020 Tokyo Olympics, starts Aug. 31 in China. Here is the weekly review of the top performing Canadian players, who play currently abroad. #1. This week's number one is former international guard Andrew Wiggins (203-95, college: Kansas, currently plays in NBA). He could not help the Minnesota Timberwolves (36-46) in their last game. 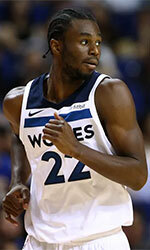 Despite Wiggins' very good performance the Minnesota Timberwolves (36-46) lost 95-99 on the road to the Denver Nuggets. He was the top scorer with 25 points. Wiggins also added 5 rebounds and dished 4 assists in 36 minutes on the court. It was Timberwolves' third consecutive loss in a row. The Regular Season already ended in the NBA. It's Wiggins' fifth season with the team. He has individually a very good year with high stats. Wiggins averages: 18.1ppg, 4.8rpg, 2.5apg, 2FGP: 44.1%, 3FGP: 33.9% and FT: 69.9% in 73 games he played so far. He played for the Canadian senior national team four years ago. #2. Second place goes to an international forward Dyshawn Pierre (198-93, college: Dayton, currently plays in Italy). Pierre led Banco di Srd to an easy victory against the closely-ranked Sidigas AV (14-12) crushing them 105-84 in the Italian Serie A last Sunday. He scored 16 points and grabbed 6 rebounds; quite an impressive performance considering it's only Pierre's third season in pro basketball. Banco di Sardegna Sassari (14-12) is placed seventh in the Serie A. It was his team's fifth consecutive victory in a row. There are only four games left until the end of the Regular Season. So now every game will be critical. Pierre's overall stats this season are: 8.9ppg, 4.2rpg, 1.5apg, 2FGP: 59.8%(52-87) and FT: 86.4%. He is in the roster of the Canadian senior national team. #3. The Canadian player who performed third best last week abroad was an international point guard Kevin Pangos (185-93, college: Gonzaga, currently plays in Spain). He contributed to a FC Barcelona's victory against the ninth-ranked Zaragoza (13-13) 91-86 in the Spanish Liga Endesa in Saturday night's game. Pangos scored 8 points and added 5 assists. FC Barcelona Lassa (22-4) is placed first in the Liga Endesa. It was his team's fifth consecutive victory in a row. Pangos' overall stats this season are: 8.9ppg, 1.7rpg, 3.3apg, 2FGP: 46.3%, 3FGP: 44.3% and FT: 78.0%. He has a dual citizenship: Canadian and Slovenian. Pangos is also a member of the Canadian senior national team. #4. Power forward Owen Klassen (208-91, college: Acadia, currently plays in Germany) led EnBW Ludwigsburg to a victory over the 13th-ranked Giessen 46ers (11-17) 98-93 in the German BBL last Sunday. He was MVP of the game. Klassen recorded 26 points (!!!) and grabbed 8 rebounds in 25 minutes. 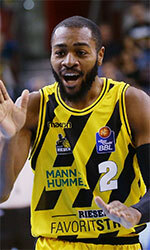 MHP RIESEN Ludwigsburg (6-10) is placed seventh in the BBL. It was his team's third consecutive victory in a row. It's Klassen's first season with the team. This year his overall stats are: 9.8ppg and 5.9rpg in 25 games. Klassen used to play for the Canadian national team back in 2017. #5. International forward Thomas Scrubb (198-91, college: Carleton, currently plays in FIBA Europe Cup) was not able to help Openjobmetis VA (4-2) in their last game on Wednesday. Despite his good performance the second-placed Openjobmetis VA (4-2) was crushed 89-66 in Wuerzburg by the leading s Oliver Baskets in the group K of FIBA Europe Cup. Scrubb was the second best scorer with 14 points. He also added 8 rebounds. Scrubb has relatively good stats this season: 12.1ppg, 4.6rpg and 1.7apg. He is another player who holds two passports: British and Canadian. Scrubb plays currently for the Canadian national team. #6. Swingman Jamal Murray (198-97, college: Kentucky, currently plays in NBA) was not able to secure a victory for the Denver Nuggets (54-28) in their game against the Utah Jazz (50-32) in the NBA, despite his very good performance in Tuesday night's game. He was the second best scorer with 22 points. Murray also added 5 rebounds in 31 minutes; not bad, considering it's only his third season in pro basketball. But the Denver Nuggets (54-28) lost 108-118 in Salt Lake City to the Utah Jazz. There are only three games left until the end of the NBA Regular Season. So now every game is very crucial. Murray has very impressive stats this year: 18.2ppg, 4.2rpg and 4.8apg in 76 games. He is a former international player as he played for the Canadian senior team four years ago. #7. Former international point guard Shai Gilgeous-Alexander (198-98, college: Kentucky, currently plays in NBA) couldn't help the Los Angeles Clippers (48-34) in their game against the Golden State Warriors (57-25) in the NBA, despite his very good performance on Saturday night. Gilgeous-Alexander recorded 18 points, 5 rebounds and 3 blocks in 34 minutes. But the Los Angeles Clippers (48-34) were badly defeated 121-104 in Oakland by the Golden State Warriors. It was Clippers' third consecutive loss in a row. This year Gilgeous-Alexander has relatively solid stats: 10.9ppg, 2.8rpg, 3.3apg and 1.2spg in 83 games. He used to play for the Canadian national team three years ago. #8. Point guard Kaza Kajami-Keane (185-94, agency: Interperformances, college: Carleton, currently plays in Holland) was the main contributor in Zwolle's victory against the seventh-ranked Amsterdam (10-23) crushing them 87-63 in the Dutch Eredivisie in Saturday night's game. Kajami-Keane was the best player in that game. He recorded 18 points, 6 rebounds and 5 assists. 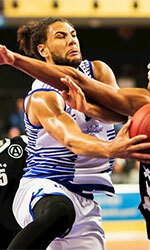 Landstede Basketbal Zwolle (26-4) is placed second in the Eredivisie. It was his team's third consecutive victory in a row. They will play only one more game in the Regular Season. And now that game is quite important. This season Kajami-Keane has very high stats. He averages: 18.1ppg, 5.8rpg, 4.2apg and 3.0spg. Kajami-Keane plays currently for the Canadian national team. #9. Former U18 international point guard Kenny Chery (180-92, college: Baylor, currently plays in France) was the major contributor in a Boulazac Basket's victory against the closely-ranked JSF Nanterre (13-14) crushing them 90-68 in the French Jeep ELITE ProA last Tuesday. He scored 14 points, grabbed 5 rebounds and dished 7 assists in 28 minutes. Boulazac Basket Dordogne (15-11) is placed seventh in the Jeep ELITE ProA. Chery has very impressive stats this year: 16.7ppg, 3.6rpg, 4.3apg and 1.4spg in 26 games. He used to play for the Canadian U18 national team nine years ago. #10. Center Robert Sacre (213-89, college: Gonzaga, currently plays in Japan) couldn't help Hitachi Sunrockers (27-31) in their game against Toyota Alvark (41-16) in the Japanese B League. Despite his very good performance on Wednesday night Sacre recorded a double-double by scoring 31 points and getting 10 rebounds. There are only two games left until the end of the Regular Season. This season Sacre has very high stats. He averages: 19.5ppg, 9.1rpg and 1.5apg. Sacre is a former international player as four years ago he still played for the Canadian senior national team. #11. Former U17 international power forward Tyrell Green (201-95, college: UNLV, currently plays in Hungary) couldn't help ZTE KK in their game against KTE-Duna in the Hungarian A Division, despite his very good performance in Sunday night's game. He was the top scorer with 25 points. Green also added 6 rebounds (was perfect 9-for-9 from the free throw line !!!) in 33 minutes. But his team lost 87-91. Green has very impressive stats this year: 15.8ppg and 4.0rpg in nine games. He used to play for the Canadian U17 national team seven years ago. #12. International forward Dwight Powell (211-91, college: Stanford, currently plays in NBA) helped Dallas Mavericks win their game against the Phoenix Suns 120-109 in the NBA on Tuesday night. Powell had a double-double by scoring 11 points and getting the same number of rebounds. He also added 3 assists and 3 blocks in 27 minutes. Powell has reliable stats this year: 10.6ppg, 5.3rpg and 1.5apg in 77 games. He is also in the roster of the Canadian national team. #13. An experienced international center Joel Anthony (206-82, college: UNLV, currently plays in Argentina) helped San Lorenzo win their game against the 13th-ranked Olimpico de La Banda crushing them 102-74 in the Argentinian La Liga in Saturday night's game. Anthony recorded 13 points, 4 rebounds and 2 blocks. Anthony's total stats this season are: 7.2ppg, 5.6rpg and 1.2bpg. He is also Canadian national team player. #14. International guard Philip Scrubb (191-92, college: Carleton, currently plays in VTB United League) couldn't help Zenit in their game against Unics Kazan in the VTB United League, despite his good performance last Sunday. Scrubb was the second best scorer with 12 points in 22 minutes. But his team was edged 74-72. Scrubb's stats this year are: 11.0ppg, 2.1rpg and 4.0apg in 23 games. He plays currently for the Canadian national team. #15. Former international shooting guard Andrew Rautins (193-86, college: Syracuse, currently plays in Turkey) couldn't help Acibadem in their game against Besiktas in the Turkish BSL. Despite his very good performance on Sunday night Rautins was the second best scorer with 17 points. He also added 5 rebounds. Rautins averaged so far 14.8ppg, 2.8rpg and 3.0apg. He is a naturalized American. Rautins used to play for the Canadian national team six years ago. #1. Matthew Wright (193-G-91, college: St.Bonaventure, currently plays in Philippines) could not help Phoenix (9-2) in their last game. Despite Wright's very good performance the league leader Phoenix lost 88-100 on the road to the lower-ranked (#5) SM Beermen. He was the top scorer with 22 points. Wright also added 7 rebounds and 3 assists (made all of his six free throws) in 32 minutes. Wright has individually a very good year with high stats. He averages: 18.6ppg, 5.4rpg, 4.6apg and 1.3spg in 13 games he played so far. Wright has a dual citizenship: Canadian and Filipino. #2. Chris Boucher (208-C/F-93, college: Oregon, currently plays in NBA) led Toronto Raptors to an easy victory against the Minnesota Timberwolves (36-46) crushing them 120-100 in the NBA last Tuesday. Boucher recorded a double-double by scoring 15 points and getting 13 rebounds. He also added 2 blocks. The Toronto Raptors have a solid 58-24 record this season. There are only three games left until the end of the NBA Regular Season. So now every game will be critical. Boucher's total stats this season are: 3.3ppg and 2.0rpg. He is another player who holds two passports: Canadian and Saint Lucian. #3. Norbert Torres (198-F-90, currently plays in Philippines) was the major contributor in a Rain or Shine's victory against the sixth-ranked Hotshots (6-5) 93-80 in the Filipino PBA last Sunday. Torres scored 16 points and grabbed 5 rebounds. Rain or Shine Elasto Painters (8-3) are placed second in the PBA. Torres' total stats this season are: 8.8ppg and 3.4rpg. He has both Canadian and Filipino nationalities. #4. Dejan Kravic (211-F/C-90, college: Texas Tech, currently plays in Italy) was not able to help Virtus Bologna in their game against Happy Casa BR (16-10) in the Italian Serie A. He scored 6 points and grabbed 6 rebounds. Virtus Bologna was badly defeated 77-61 at home by the much higher-ranked Happy Casa BR (#4). It was Virtus Bologna's third consecutive loss in a row. There are only four games left until the end of the Regular Season. Kravic averaged so far 10.7ppg, 6.0rpg and 1.2bpg. He also holds two passports: Serbian and Canadian. #5. Kassius Robertson (191-G-94, college: Missouri, currently plays in Germany) was not able to secure a victory for BBC Bayreuth (12-15) in their last game. 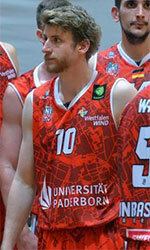 Despite Robertson's good performance BBC Bayreuth lost 81-90 in Oldenburg to the second-ranked EWE Baskets. He was the second best scorer with 12 points. Robertson also added 3 passes in 26 minutes. It was BBC Bayreuth's fourth consecutive loss in a row. Robertson averaged so far 12.9ppg, 2.0rpg and 2.8apg in 27 games. #6. Experienced Billy McNutt (203-C/F-85, currently plays in Luxembourg) led Etzella to an easy victory against the second-ranked Amicale crushing them 86-60 in the Luxembourg Total League in Wednesday night's game. He recorded a double-double by scoring 21 points and getting 11 rebounds. McNutt also added 2 blocks. This season McNutt has very high stats. He averages: 23.5ppg, 12.1rpg, 2.0apg, 1.4bpg and 1.6spg. #7. Jamal Williams (196-F-86, college: Regina, currently plays in United Kingdom) couldn't help Newcastle Eagles in their game against Sheffield Sharks in the British BBL. Williams scored 9 points. His team was defeated 76-72. Williams' total stats this season are: 5.6ppg, 3.1rpg and 1.6apg. He has Canadian and British nationalities. #8. Joe Rocca (193-G, college: Carleton, currently plays in Slovakia) couldn't help Nova Ves (9-7) in their last game. Despite Rocca's very good performance Nova Ves was crushed 102-69 on their home court in Nova Ves by the leading Inter Bratislava. He was the top scorer with 23 points. Rocca also added 4 rebounds and dished 3 assists in 29 minutes. Rocca averaged so far 13.8ppg, 3.9rpg and 1.3apg in 35 games. #9. Mathieu Kamba (196-G-95, agency: Dynamics Global Management, college: Cent Arkansas, currently plays in Spain) couldn't help Araberri (7-24) in their last game. Despite his very good performance the bottom-ranked Araberri lost 82-94 on their home court in Vitoria-Gasteiz to the much higher-ranked (#7) Palencia_Baloncesto. Kamba was the top scorer with 20 points. He also added 5 assists in 34 minutes. Kamba averaged so far 12.6ppg, 3.6rpg, 1.6apg and 1.9spg in 31 games. He has Canadian and DR Congolese nationalities. #10. Kiefer Douse (190-G-92, college: Canisius, currently plays in United Kingdom) contributed to a Leicester Riders' victory against the closely-ranked Glasgow Rocks 75-71 in the British BBL last Friday. Douse scored 7 points in only 10 minutes. This year Douse's total stats are: 4.0ppg, 1.8rpg and 2.0apg in 25 games. Luoyang Zhonghe (NBL) added to their roster 24-year old American point guard Braylon Rayson (175-86kg-94, college: Cent Michigan). He spent his 2-year professional career in Canada. He just played at Sudbury Five in Canadian NBL league. In 42 games he recorded very impressive stats: 24.5ppg, 4.0rpg and 4.8apg this season. The last season Rayson played at Windsor Express in Canadian NBL Canada where in 37 games he averaged 14.3ppg, 3.3rpg and 2.2apg. The list of the past achievements is quite long as among others his team won MAC West Division Regular Season in 2015. Rayson was also voted All-MAC 3rd Team in 2016 and 2017 at his college time. This season he was named All-NBL Canada MVP. Rayson graduated from Central Michigan University in 2017 and it is his second season as a professional player. Gimnasia y Esgrima Comodoro Rivadavia (La Liga) agreed terms with 31-year old Canadian ex-international guard Diego Kapelan (190-87, college: McNeese State, agency: Octagon Europe). He is a dual citizen owning also Bosnia and Herzegovina passport. Kapelan just played at Soles in Mexican LNBP. He managed to play in three leagues in two countries this year. In 11 LNBP games he had 9.5ppg, 1.7rpg and 1.8apg. Kapelan also played for St. John's Edge in Canadian NBL Canada where in 31 LNBP games he recorded 10.9ppg, 2.4rpg and 1.4apg. The other team he played shortly was BC Siauliai (LKL) in Lithuanian league. But in four LNBP games he averaged only 0.5ppg. 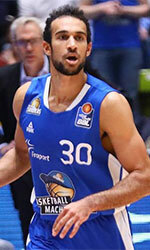 Kapelan also played 2 games in Basketball Champions League where he got 5.5ppg and 1.5spg. His team won Southland Conference East Division Regular Season in 2011. Kapelan was a member of Canadian Senior National Team two years ago. He is quite experienced player. Kapelan has played also professionally in Austria (Raiffeisen Flyers Wels), Cyprus (Apollon), Germany (ETB Wohnbau), Greece, Spain (Ourense and Melilla Baloncesto) and Bosnia (HKK Zrinjski HT Mostar). He attended McNeese State until 2011 and it is his eighth season as a professional player. On Kapelan: Pure shooter who can bring ball up floor when needed. Deadly 3point shooter with supreme confidence on his shot. Can pull up from deep as well as of the dribble inside the 3point line. Good ball handler and passing skills. Needs to improve on defense. Here is the weekly review of the top performing Gee-Gees alumni, who are currently playing in pro basketball. #1. Johnny Berhanemeskel (6'2''-G-92, graduated '15, plays pro in Spain). He could not help Zaragoza (8-8) to beat Real Madrid (12-4) in the Spanish Liga Endesa. Berhanemeskel recorded 9 points in only 14 minutes. But Zaragoza was edged 98-96 on the road by the higher-ranked Real Madrid (#3). This season Berhanemeskel averages 8.4ppg, 1.5rpg and 1.4apg. #2. Adam Presutti (6'2''-PG-92, graduated '17, plays in Slovakia) was not able to help Nova Ves in their game against Handlova (6-14) in the Slovakian SBL. He recorded 7 points. Nova Ves lost 84-88 on the opponent's court to the one of league's weakest teams (#8) Handlova. This year Presutti averages 8.4ppg, 1.8rpg and 2.5apg in 18 games he played so far. He has also Italian passport. #3. Caleb Agada (6'4''-G-94, graduated '17, currently in Spain) was not able to secure a victory for Melilla Baloncesto (10-7) in their game against Ourense (10-7) in the Spanish LEB Gold (second division). It was not Agada's best game last Saturday. He scored only 3 points and grabbed 6 rebounds in 13 minutes. Melilla Baloncesto was defeated 68-60 on the opponent's court by the lower-ranked Ourense (#7). It was Melilla Baloncesto's first loss after three consecutive victories. It's Agada's first season with the team. Agada has relatively good stats this year 10.1ppg, 5.6rpg, 1.9apg and 2.3spg. He has also Nigerian citizenship. #4. Jean Emmanuel Pierre-Charles (6'8''-F-93, graduated '18, plays pro in Spain) couldn't help Araberri (5-12) in their game against Leyma Basquet (2-11) in the Spanish LEB Gold (second division). Pierre-Charles' contribution was not very remarkable in Friday's game. He scored only 2 points and grabbed 5 rebounds. Araberri lost 82-96 in Coruna to the higher-ranked (#13) Leyma Basquet. It was Araberri's fourth consecutive loss in a row. It's Pierre-Charles' first season with the team. This year Pierre-Charles averages 4.6ppg and 4.8rpg in 17 games. #5. Terry Thomas (6'4''-G/F-91, graduated '14, plays in Canada) couldn't help the Halifax Hurricanes (10-9) in their game last Saturday. 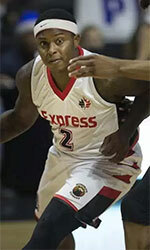 Despite his very good performance the Halifax Hurricanes (#3) were edged 114-111 in Moncton by the leading Magic. Thomas was the top scorer with 29 points. He also added 7 rebounds in 40 minutes. This season Thomas averages 4.6ppg and 4.8rpg. Notice: The list above includes only some of the University of Ottawa alumni playing currently in pro basketball. Check COMPLETE LIST. Here is the weekly review of the top performing Ravens alumni, who are currently playing in pro basketball. #1. Kaza Kajami-Keane (6'1''-PG-94, graduated '17, plays pro in Holland) led Zwolle to a victory over the league outsider Weert (2-12) 84-69 in the Dutch Eredivisie in Sunday night's game. He was MVP of the game. Kajami-Keane recorded 27 points (!!! ), 6 rebounds, 8 assists and 4 steals in 31 minutes; quite an impressive performance considering it's only his second season in pro basketball. Landstede Basketbal Zwolle (14-0) is placed first in the Eredivisie. So far his team won all fourteen games in the Regular Season. Kajami-Keane has individually a very good year with high stats. He averages 18.7ppg, 5.3rpg, 3.5apg and 3.3spg in 13 games he played so far. #2. Thomas Scrubb (6'6''-F-91, graduated '15, plays in Italy) was the main contributor in a 3-point Openjobmetis Varese's victory against the closely-ranked Banco di Srd (1-1) 90-87 in the FIBA Europe Cup last Wednesday. Scrubb was MVP of the game. He scored 19 points and grabbed 4 rebounds. It was the game of the round between two top 2 ranked teams in group K. Openjobmetis Varese (2-0) is placed first. There are only four games left until the end of the FIBA Europe Cup Second Stage. So now every game will be critical. It's Scrubb's first season with the team. Scrubb has relatively good stats this year 13.1ppg, 4.1rpg and 1.1apg. He has also Canadian citizenship. #3. Philip Scrubb (6'3''-G-92, graduated '15, currently in Russia), who plays in Russia could not help Zenit Sankt Petersburg in their last game. Despite Scrubb's very good performance the third-placed Zenit Sankt Petersburg was edged 84-81 on the road by the lower-ranked (#3) ASVEL Lyon-Villeurbanne Basket in the group H of Eurocup. He was the top scorer with 18 points in 24 minutes. It's Scrubb's first season with the team. Scrubb has relatively good stats this year 13.2ppg, 2.7rpg, 3.0apg and 1.1spg in 10 games. He has also British nationality. #4. Experienced Aaron Doornekamp (6'7''-F-85, graduated '09, plays pro in Spain) contributed to a Valencia Basket's victory against the 13th-ranked Burgos (5-8) 87-77 in the Spanish Liga Endesa in Saturday night's game. Doornekamp scored 9 points. 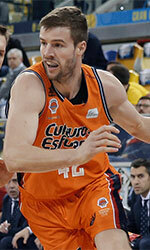 Valencia Basket (7-4) is placed fifth in the Liga Endesa. It was his team's sixth consecutive victory in a row. This season Doornekamp averages 4.9ppg, 3.2rpg and 1.7apg. He has also Dutch passport. #5. Connor Wood (6'4''-G-93, graduated '18, plays in Germany) helped Uni Baskets Paderborn win their game against the closely-ranked Nuernberg (7-7) 77-69 in the German ProA (second division) last Sunday. Wood scored 10 points in 24 minutes. Uni Baskets Paderborn (2-6) is placed ninth in the ProA. Wood has relatively good stats this year 12.2ppg, 2.3rpg and 2.7apg in 15 games. #6. Joe Rocca (6'4''-G, graduated '17, currently in Slovakia) was not able to help Nova Ves in their game against Inter Bratislava in the Slovakian SBL. He scored 8 points. His team was crushed by 39 points 105-66. Rocca has relatively good stats this season 12.7ppg and 3.8rpg. #7. Ryan Ejim (6'7''-F-93, graduated '17, plays pro in Spain) helped Gijon Basket win their game against the leader Culleredo 82-63 in the Spanish EBA (fourth division) in Saturday night's game. He had a double-double by scoring 14 points and getting 18 rebounds. Ejim also added 3 assists and 5 blocks in 32 minutes. Ejim has very impressive stats this year 17.2ppg, 10.7rpg and 1.9apg in 10 games. #8. Guillaume Boucard (6'6''-F-90, graduated '16, plays in Canada) managed to help St. John's Edge to win against the Island Storm 123-116 in the NBL Canada last Sunday. He scored only 2 points. This season Boucard has very high stats. He averages 17.2ppg, 10.7rpg and 1.9apg. Notice: The list above includes only some of the Carleton University alumni playing currently in pro basketball. Check COMPLETE LIST. We bring you last week's top former Rams players who are currently playing in pro basketball. #1. Aaron Best (6'4''-G-92, graduated '16, plays pro in Germany) could not help MHP RIESEN Ludwigsburg (2-7) in their game last Wednesday. Despite his good performance MHP RIESEN Ludwigsburg was defeated 82-76 on the road by the second-ranked Sidigas AV. Best scored 10 points in 17 minutes. It's Best's first season with the team. This year he averages 7.6ppg, 2.6rpg and 1.1spg. #2. Jahmal Jones (6'0''-PG-91, graduated '15, plays in Slovakia) was not able to help Prievidza in their game against Nova Ves (6-10) in the Slovakian SBL, despite his very good performance in Wednesday night's game. Jones was the second best scorer with 17 points. He also added 5 rebounds. But Prievidza lost 73-80 in Nova Ves to the lower-ranked (#6) Nova Ves. It was Prievidza's first loss after three consecutive victories. Jones has relatively good stats this year 12.8ppg, 3.4rpg, 2.8apg and 1.4spg in 16 games he played so far. #3. Adika Peter-McNeilly (6'3''-G-93, graduated '17, currently in Germany) was not able to secure a victory for Mitteldeutscher BC Weissenfels (1-9) in their game against Deutsche Bank Skyliners (4-6) in the German BBL. He scored only 4 points in 18 minutes. Mitteldeutscher BC Weissenfels was defeated 95-89 in Frankfurt by the higher-ranked Deutsche Bank Skyliners (#12). It was Mitteldeutscher BC Weissenfels' fourth consecutive loss in a row. But this is still an early stage of the season and everything may happen. It's Peter-McNeilly's first year with the team. This season Peter-McNeilly averages 6.2ppg, 2.6rpg, 2.0apg and 1.4spg.